A highly entertaining match at The Runnymede Stadium saw a two goal comeback, a late winner, a spectacular goal, and plenty of attacking football as Egham Town FC and Ashford Town (Middlesex) FC faced off in this FA Trophy Preliminary Round tie. …and the novel way it’s displayed! This was my first visit to Egham’s ground, but it won’t be my last. From the friendly welcome from Jim on the turnstile, to the innovative way they display the teamsheet, to the action on the pitch, this was a hugely enjoyable experience for watching football. The two teams play in the same division, Southern League Division One Central, with Egham sixth and their visitors fourteenth. 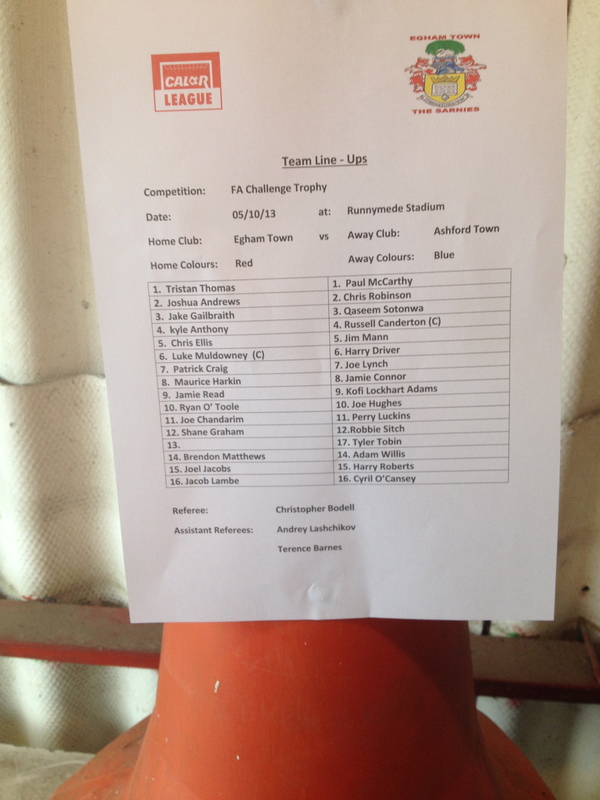 And it was Ashford who had the early chances, with Joe Hughes in particular among the chances. Inside the first thirteen minutes, Hughes had three good efforts, all saved by Egham ‘keeper Tristan Thomas. The best was an effort that Thomas tipped up into the air, and was lucky to see it drop onto the crossbar and over. Egham soon got into the game, and on seventeen minutes Kyle Anthony met a Mo Harkin corner with a volley that went narrowly over. Six minutes later, though, and the home side were in front. Ryan O’Toole ran down the right and played an accurate low cross to the waiting Patrick Craig who finished low into the corner, leaving Paul McCarthy wrong footed in the Ashford goal. The lead was almost immediately wiped out, as Kofi Lockhart-Adams launched himself at a cross, only for Thomas to brilliantly deny the striker’s flying header with a point blank save. Joe Hughes’ effort from the rebound went agonisingly wide. Hughes had another effort on the half hour, but it was defelcted wide for a corner, and Jim Mann headed the ball just wide from a cross. 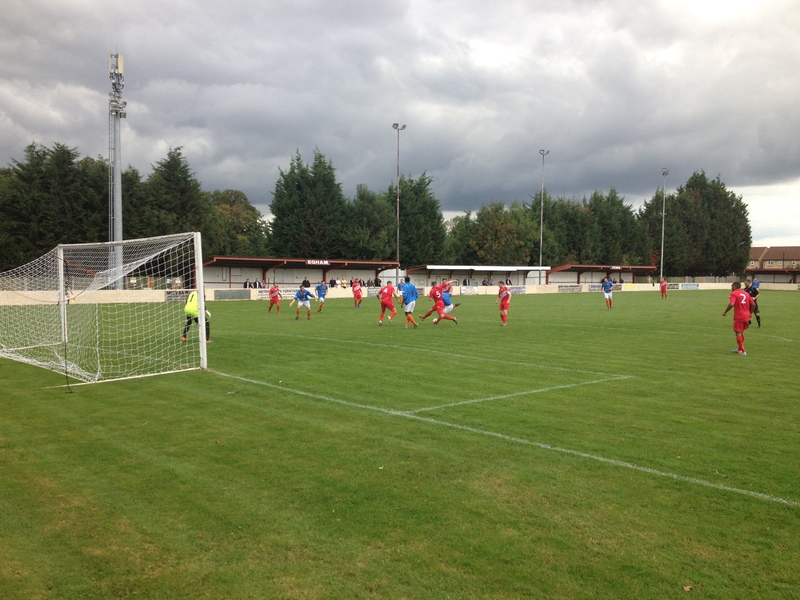 The lively first half continued to produce chances, with Egham pressing for the cushion of a second goal. Patrick Craig and Joe Chandarim combined well, with the former’s shot going wide. Chandarim himself then had a chance, but could only head over from a Joshua Andrews cross. It was then Andrews’ turn to go for goal, going on a great run before hitting a shot that McCarthy did well to save after it took a deflection. On the stroke of half time, though, Egham did get their second. Chandarim was given the freedom of the ground to control the ball and fire left footed into the bottom corner. I tweeted at half time that I felt there was a comeback in this match, and within ninety seconds of the restart, the deficit was halved. Joe Hughes danced passed a couple of challenges before thumping home a brilliant shot that gave Thomas no chance. It was just the start Ashford needed. The game hit a little bit of a lull after the goal, and it wasn’t until just before the hour mark before we saw another decent chance, when Joe Lynch headed over from a corner. As is often the case, it ended up being a substitution that made a big impact. Ashford brought on Cyril O’Cansey for Perry Luckins, and he scored the leveller within a minute. The ball was laid off to him on the left, and he hit a first time shot that Thomas got hands to. However, the ball spun into the corner of the net, with Thomas and Lockhart-Adams battling to get to it. Lockhart-Adams will doubtless claim the goal, but the consensus of the fans behind the goal was that the goal belonged to O’Cansey. Into the last ten minutes, and Egham won two freekicks in quick succession. The first was hit by O’Toole, but McCarthy saved it well. Just a minute later, though, and Mo Harkin stepped up and fired a lovely freekick into the corner to restore the home side’s lead. McCarthy will feel he could have done better, as he got hands to the shot but didn’t do enough to prevent the goal. There was still time for Egham to put some gloss on the game, but Chandarim fired wide after dancing through the defence, and then substitute Jacob Lambe’s shot was well saved. The game finished 3-2 to Egham, and it was probably just about deserved. Ashford did well, especially in coming back from two down, but in the end the higher placed team triumphed, and progress to the First Qualifying Round, where they will entertain Dicot or Cirencester Town, who will go to a replay after they drew 1-1 in their game. 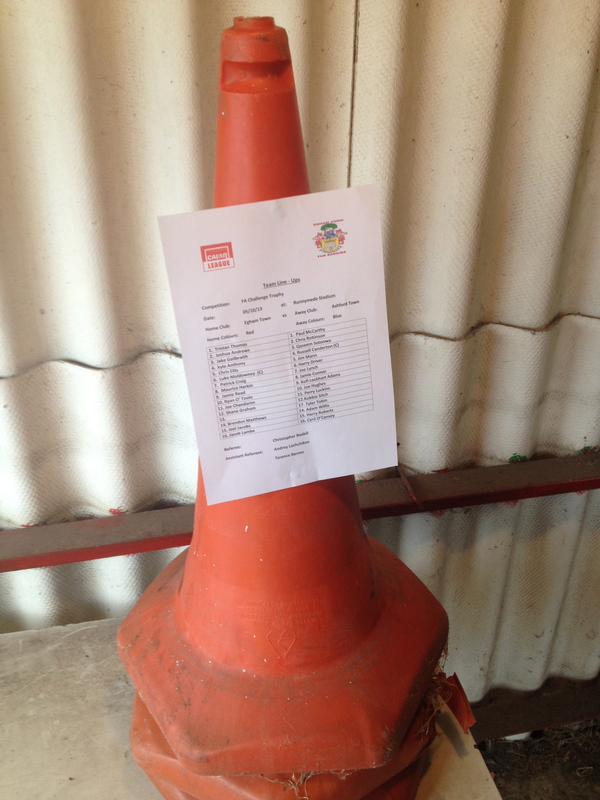 Posted on October 5, 2013, in UTL Archive and tagged Ashford Town (Middlesex), Egham Town, FA Trophy. Bookmark the permalink. Leave a comment.